Argor Heraeus is one of Switzerland's most prominent precious metals refineries, and they sell a range of gold, silver, platinum and palladium bars to precious metals investors worldwide. 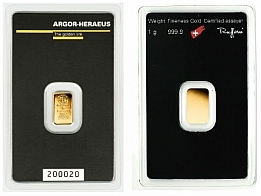 Argor Heraeus's multigram gold bar is available in 5 and 10 gram sizes. 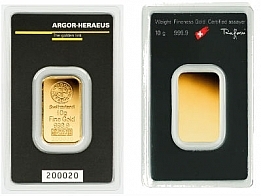 The bar features 10 x 1 gram Argor Heraeus gold bars, which are individually sealed inside a single certicard. The front of each bar is the Argor Heraeus logo, followed by the weight and fineness of the bar. 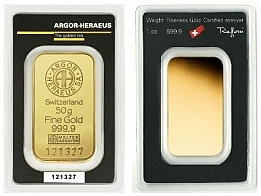 All Argor Heraeus gold bars contain 99.99% pure investment grade gold bullion. 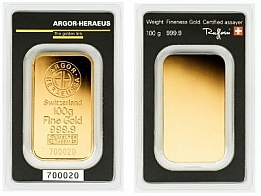 The Argor Heraeus gold bar series is very popular with gold investors, particularly those located in Europe. However, the brand is recognised worldwide as one of the most prominent precious metals refineries.